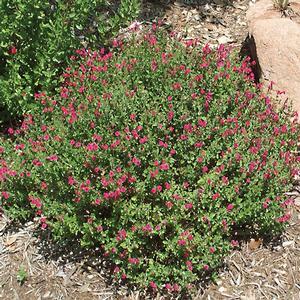 Pink skullcap is a small evergreen shrub that forms a low mound of bright green foliage about 8" tall and 1-2' wide. Waves of pink snapdragon-like flowers cover the plant in summer and fall. It's a great plant to use as edging along a path, as a small scale groundcover, in containers or spilling over the edge of a retaining wall. The plant's common name comes from the skullcap-shaped seed capsules that remain after the flowers have died. The specific epithet "suffrutescens" means "having a base that is somewhat woody and does not die down each year." Pink skullcap is native to three northern states in Mexico - Coahuila, Nuevo Leon and Tamaulipas. Pink skullcap forms a dense, low-growing mound of bright green foliage about 8-10" tall and up to 2' wide. Reminiscent of snapdragons, the tubular, two-lipped flowers are densely borne in short spikes and bloom from spring through fall and sometimes through winter as well. The small green leaves are paired on square stems. Pink skullcap's an adaptable plant; it's tolerant of full sun in both coastal and hotter inland areas. It's also happy in light shade. 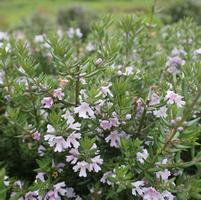 In its native habitat, pink skullcap typically grows in soils that drain readily. Happily for us gardeners, in cultivation it will tolerate a wide range of soil types including sand and clay. Avoid planting it in a location that's completely waterlogged for prolonged periods though. Once established, pink skullcap will survive in most areas on rainfall alone. Pink skullcap's a good addition to a habitat garden; it attracts hummingbirds and bees. Stem cuttings from semi-ripe wood root easily with a rooting hormone. Pink skullcap usually isn't affected by any pests or diseases. No pruning is usually necessary; perhaps just a light shearing once a year in early spring to encourage new shoots to sprout and to keep the plant nice and bushy.